I was having a hard time on picking who to draw so I ended up putting it off for a while so I could think. 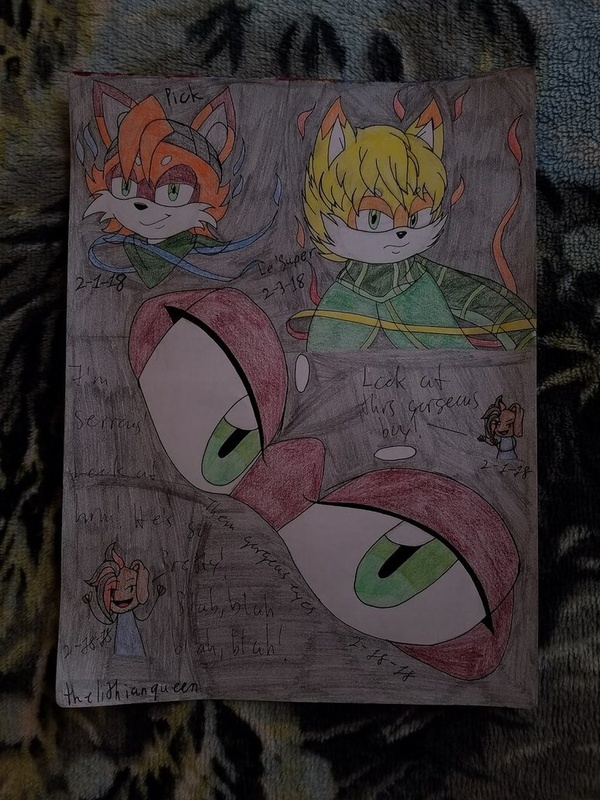 Then when I had finally made up my mind and decided on drawing Vilanda, I saw that they had added their Sonic character........ then I changed my mind completely and ended up drawing Pick instead XD. 2/1/18 - Headshot of Pick's normal form. 2/3/18 - Half(?) drawing of Pick in his super form. 2/18/18 - Close-up drawing of Pick's eyes. 2/19/18 - Added two stick figure things of my sonicsona Nori saying some of the things I thought of while drawing him XD. 2/20/18 - colored and finally uploaded. Drawings and weird stick figure sonicsona Nori @ me.